He would be visiting Deeksha Bhoomi, Jain Temple, Dragon Palace and Suresh Bhat Auditorium. President Ramnath Kovind arrived in the city at 9:50 am today. He landed at the Dr. Babasaheb Ambedkar International Airport amid tight security, where he was welcomed by senior political leaders from various parties. 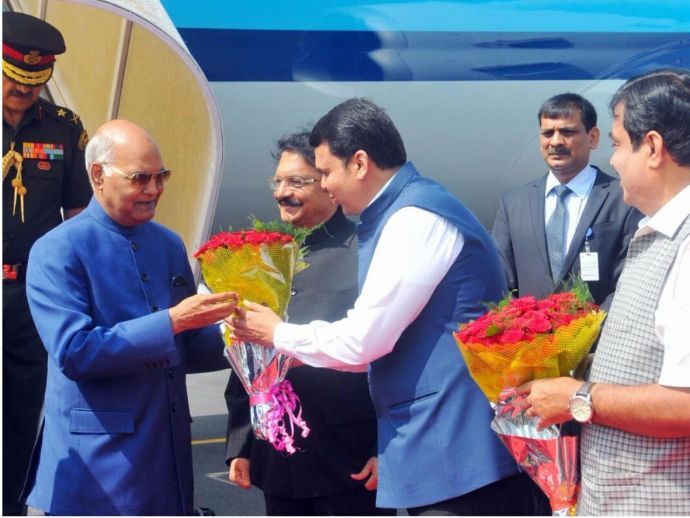 Among the people who welcomed Kovind were, Chennamaneni Vidyasagar Rao, Maharashtra Chief Minister Devendra Fadnavis, Union Minister Nitin Gadkari, Nagpur district collector, police commissioner and other senior bureaucrats. Shortly after his arrival, he visited Deekshabhoomi along with his convoy. After the Deekshabhoomi visit, he is to leave for Ramtek by road, where he would be paying a visit to the Shantinath Jain Temple. On his way back, Kovind is scheduled to visit the Dragon Palace, Kamptee, where he would be inaugurating the Vipassana Meditation Centre. After returning to the city, he would be spending some reserve time at Raj Bhavan. Later in the afternoon, the President is supposed to inaugurate NMC’s Suresh Bhat Auditorium in Reshimbagh. At around 5:30 pm, Kovind is scheduled to leave for Delhi.